The win less Dallas Cowboys traveled to Nashville, Tennessee to take on the 1-0 Tennessee Titans and current AFC South leader on Sunday at LP Field. They didn’t stay winless long as they handled the Titans very easily on the way to a 26 to 10 victory at LP Field. The Cowboys dominated early on and never let up cruising handily to the win. It’s difficult to place a loss entirely on one person and I won’t do that to Jake Locker. Locker didn’t have his best game however. He was off target in the first half and on one occasion looked like he was scared to pull the ball down and run with it. Locker is thinking too much in this new system and it would behoove the Titans to return to running the ball like they did against Kansas City. 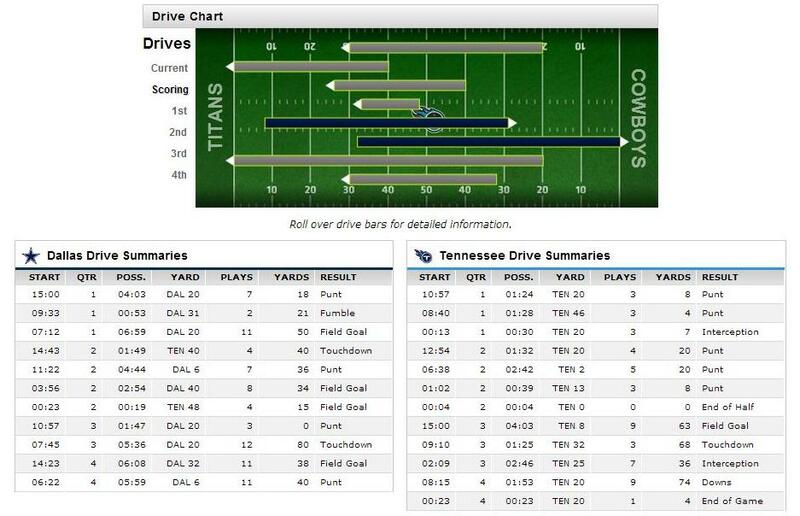 Locker threw the ball 34 times and the Titans only ran 11 designed run plays but Locker added two runs of nine yards. He finished 18 of 34 for 234 yards, one touchdown and two interceptions. His second interception was off a pass tipped by Henry Melton at the line. While Locker was bad, he didn’t get a ton of help from Nate Washington. Two of Locker’s throws could have been placed better, but Washington was manhandled most of the game by the Cowboys secondary and failed to haul in the catches. He was targeted six times and finished with one reception for one yard. The lone bright spot in the passing game was Titans tight end Delanie Walker, who set career highs in many categories including receptions with 10, receiving yards with 142 and longest career reception of 61. The only downside was a fumble recovered by Justin Hunter and a drop. Shonn Greene had a good day running the ball when he got the chance. He carried the ball five times for 40 yards with a 8.0 yards per carry average. Dexter McCluster added four carries for 30 yards. Bishop Sankey just isn’t ready and finished with two carries for three yards. The Titans defense played some solid football they just stayed on the field too long. The Cowboys dominated the time of possession holding the ball for 41:11 minutes while the Titans held the ball a mere 18:49. The Titans were penalized five times for 30 yards and three of those gave the Cowboys offense a first down. Pollard had his third penalty of the season this time a late hit and could be in danger of hearing from the Commissioner soon if they keep adding up. Where the Titans defense really struggled was in the run game. Demarco Murray ran all over them and it is here where the Titans are really missing Alterraun Verner who was a big part of both their run and pass defense and one of their better tacklers. I am anxious to see how many missed tackles Pro Football Focus counts in this game. Murray finished with 29 carries for 167 yards and one touchdown (5.8 YPC). Lance Dunbar and Joseph Randle contributed too as the Cowboys rushed for 220 yards. The Cowboys ran 43 rushing plays in the game and averaged 5.1 yards per carry. The Titans defense also allowed the Cowboys to convert on 9 of 16 third downs for a 56% conversion rate. Some of this is a direct correlation to how poorly the Titans offense converted on third downs with only two out of ten for a 20% conversion rate. The Titans inability to remain on the field on offense put the defense in a bad spot. Tony Romo was sacked four times for a loss of 28 yards but was otherwise efficient. He went 19 of 29 for 176 yards and a touchdown. He did not throw an interception this game after throwing three against the San Francisco Forty Niners in Week 1. The Cowboys average gain per offensive play was 4.8 while the Titans was 6.4. Jason McCourty went down in the first half and watched the game from the sidelines in the second. Dez Bryant proceeded to eat the Titans secondary up with 10 receptions for 103 yards and a touchdown. Former Tennessee Volunteer Jason Witten added four receptions for 32 yards. Titans strong safety Bernard Pollard led the defense in tackles with 11 total (10 solo and an assist). He also had a tackle for a loss, a sack, and a quarterback hit. The Titans free safety Mike Griffin was next seven total tackles (six solo and an assist). He also had a tackle for a loss. Your safeties leading the team in tackles is generally not a good sign for the defense. Titans defense end Jurrell Casey had a big game with two solo tackles, two sacks, two tackles for a loss and two quarterback hits. Ropati Pitoitua had a sack, three solo tackles, two tackles for a loss and a quarterback hit. On first glance, it seemed Zaviar Gooden is filling in quite nicely at inside linebacker replacing Zach Brown. Outside of Ryan Succop, who was a fantastic pickup by the Titans, their special teams were awful. Coverage units remain a big question mark and Leon Washington has been a bit shaky the past two games. Brett Kern had a punt partially blocked and was otherwise just decent. He only dropped one punt inside the 20 yard line. I thought the coaching and play calling was a bit subpar. The Titans did not appear ready for their home opener and the play calling at times was head scratching. Early on the Titans had the ball 3 and 2 and were successfully running it but opted for a low completion percentage pass. They did not convert. The Titans will travel to Cincinnati next week to take on the Bengals who are 2-0 and coming off a stomping of the Atlanta Falcons. The Titans will need to play light years better for them to have a chance. You can find the full game log here.